Learning shouldn’t happen in a vacuum. We’re here to help and support students through a wide range of services–from advising to tutoring to career counseling. 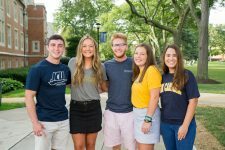 Academic advising is central to the student experience at John Carroll. Whether pursuing internships or registering for classes, you can turn to your advisor for help. Advisors can refer you to appropriate on-and off-campus resources, assist in academic planning, and provide career development support. Fall semester of freshman year, advisees will meet with advisors in group format for four cohort advising sessions. Students will consult regularly with their assigned academic advisor for the first four semesters of enrollment, or until they have earned 45 credits and are eligible to declare a major. When you are ready to decide on a major, you will be assigned to a major advisor in your academic program. Get all the support you need to map your interests, skills, and values to potential careers and majors. We’ll then help you figure out a plan to get both the coursework and real-world experience you need to develop the skills necessary to achieve your career goals. When you’re ready to look for a job, we’re here to review your résumé, conduct mock interviews, and launch your job search. Learn more. The Learning Commons is a collaborative learning center in our library that offers free tutoring and peer-led study tables, résumé help, study skill workshops, and a variety of other fun and interactive programs to support your academic and career development. Learn more. Student writing consultants can assist with nearly any aspect of writing, and can help you at any point in the writing process. They can help you brainstorm, organize ideas, craft a thesis statement, restructure an essay, clarify and expand key points, formulate citations, and refine word, grammar, and punctuation choices. Learn more. Develop your gifts and abilities through our Leadership Development Programs that tackle how to develop professional relationships and communication skills, determine your leadership style, understand and apply your strengths, and form an ethical approach to leadership. Learn more. There are also plenty of opportunities to take leadership roles on campus as Resident Assistants, Orientation Leaders, Immersion Coordinators, Retreat Leaders, CSSA Student Liaisons, and in roles related to your degree such as on-air show host at WJCU 88.7 FM and as a writer for The Carroll News. The Boler School’s unique Professional Development Program prepares business majors for their future careers through a series of courses to practice and build professional skills. Learn more. The award-winning John Carroll Mentoring Network is an online database with direct access to hundreds of alumni mentors from a wide range of career paths who are eager to offer their insight, experience, and support to undergraduates. Learn more. Our goal is to provide students with disabilities an equal opportunity to competitively pursue a college education. Student Accessibility Services (SAS) provides accommodations and support for students with disabilities. Learn more. Our Pre-Health Professions Program includes a full-time director and a physician-in-residence. They’ll help you map out a plan to navigate course selections, understand career paths, gain relevant experience, and build relationships with and apply to medical, dental, pharmacy, physician assistant, and other health-related programs. We provide personalized application and interview preparation through our Health Professions Advisory Committee (HPAC). An entire team of faculty and staff will help you evaluate your skills, create a compelling application, and nail the program interview. Learn more. While academic programs in entrepreneurship were once exclusively business focused, John Carroll looks at entrepreneurship as a way of thinking and developing an entrepreneurial mindset, with a focus on teaching students to recognize opportunities in both for-profit and non-profit organizations. In addition to a minor that is available to any major, the Center offers programs such as the Student Hatchery, a unique opportunity to bring your idea to market; the ideaLab and Soper Prize, idea contests open to all undergraduate students in all majors. Learn more.